Can't wait for this. Part 2 was a big success in Japan. They had to book bigger screens than originally planned because screenings were selling out. I saw it in a medium size multiplex where it was playing on the biggest screen. Lots of audience, women too. 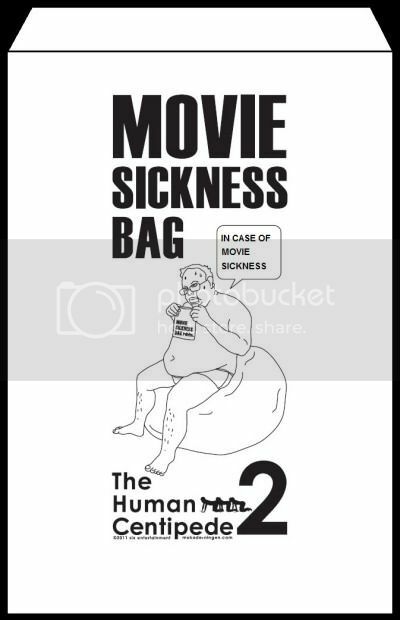 And everyone was given a "movie sickness bag" in case you'd like to throw up They were selling Human Centipede toys, too. Can't say I can muster much enthusiasm for this after the abomination that was part 2 tbh, but at least it looks like a return to the camp spirit of the first film (only ramped up to 11). “If I had to make a fourth one, which I might do in 20 years from now, who knows, it will be about connecting all starving Africans on the African continent done by a charity organization, to solve the hunger problem…." Tom Six goes super-meta with the two stars from his previous films applying the centipede concept to prisoners after having watched Human Centipede I and II on DVD. They even invite the director (Tom Six as himself) to assist with the project. It's neither as funny nor as scary as Human Centipede II, it takes too long to really get going, and Dieter Laser's insane overacting can be quite irritating, yet there is something oddly fascinating about it. I have to admit I had this crazy grin on my face for the last 30 minutes, not only because it's funny, but also because it's so great to see someone still doing such crass exploitation with decent production values. Oh, and Laurence R. Harvey is a genuinely good actor, as anyone who saw Human Centipede II should know. Although nowhere near the hit Human Centipede II was in Japan, I was glad to see pretty strong attendance in the screening I went to, also with many female viewers. And then there was this one (presumably) middle aged businessman who didn't want anyone to know he came to see Human Centipede III. He came in with a flu mask on his face and briefcase on his shoulder, sat in the front row (still with a briefcase on his shoulder), and then stayed there after the film until everyone else had left. Never managed to see his face.